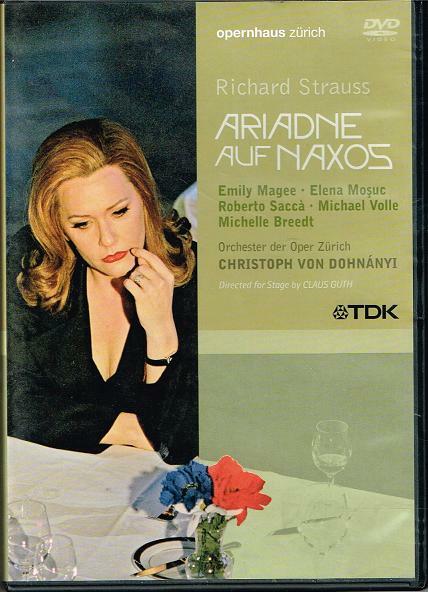 "In a series of groundbreaking productions from the Opera Zürich, TDK presents a production of ARIADNE AUF NAXOS , one of many masterly opera cooperations by composer Richard Strauss and librettist Hugo von Hofmannsthal. 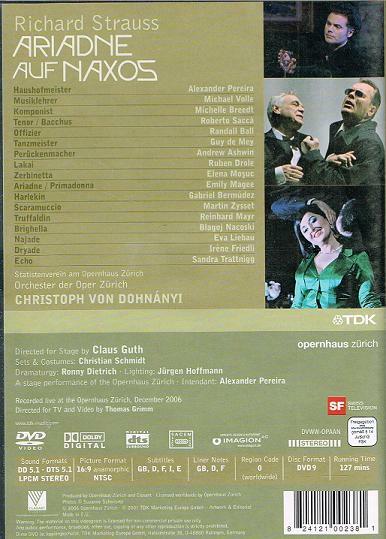 Under the direction of one of the best Strauss conductors of today, Christoph von Dohnányi, with a cast of particularly strong singer-actors and a highly intense and thrilling dramatization, this staging made for a visually and musically powerful opera viewing on DVD. A rich man invites to a banquet at which – at his wish – a new opera, Ariadne auf Naxos, is to be performed simultaneously with the improvised play The Faithless Zerbinetta and Her Four Lovers. The artists - composer, singers and the actors from the Zerbinetta’s travelling troupe - out of sheer necessity abide to the arbitrary decision of the owner of the house and accept his interference with art. Thus the theme of the works is set off: The barriers between the two seemingly mutually exclusive principles, life and art, are lifted and throughout the work, they are brought together by a dense network of countless conversational cross-references and musical self-reflections. In the present production, Ariadne is sung by the American soprano Emily Magee, who has been acclaimed all over the world in works by both Wagner and Strauss, while the part of Bacchus is taken by the German-born Italian tenor Roberto Saccà, who is now regarded as one of the leading lyric tenors of his generation. Both were making their role débuts under the subtle yet sensual conducting of Christoph von Dohnányi, and both were acclaimed for their vocal radiance, subtle handling of the text and the care that they lavished on the technical aspects of their parts. The critics were also captivated by the rest of the brilliant cast: Elena Moşuc as Zerbinetta, exploring the incredible heights in her role, Michael Volle as vocally resplendent Music Master, Guy de Mey as extravagant Dancing Master and Michelle Breedt as touching Composer. “Astuteness, wit and artistic understanding combine in this production to produce an evening that once again reveals the Zurich Opera at its best.” Summed up the critic of the Neue Zürcher Zeitung. A wonderfully humorous and highly self-ironic step was to cast Alexander Pereira, long-standing successful director of the Zurich opera in the role of Haushofmeister (the major-domo) – he is the mighty master of ceremonies acting on behalf of his enormously rich employer who is forcing art to bow to his predilections. Exploring the essence of the piece, the director Claus Guth and his designer Christian Schmidt worked with the binary opposites that are posited on every level of the work and that seem to be so clear-cut: on the one hand, there is the reality of the prologue and, on the other, the artificiality of the opera. In this production, curtains symbolizing the theatre behind their backs provide the mere undecorated space within which the prologue is acted out. The protagonists are in a state of suspension, not yet having laid aside their old personalities and not yet having assumed the new roles assigned to them. Conversely, the artistic character of the opera itself is explored, revealing within this uniquely artificial construct the most profound of human truths, that the antinomies of life and art, being and appearance, fidelity and infidelity, deathly paralysis and living transformation are artificial and actually much more interconnected than meets the eye. In order to be able to achieve the greatest possible degree of realism for their reading of the piece, Guth and Schmidt locate this ‘opera within an opera’ not on the famous deserted island where Ariadne is stranded, but inside the authentically reconstructed Kronenhalle in Zurich. This makes for a visually very attractive setting: Ariadne sits lonely in front of a glass of wine and in come Zerbinetta and her lovers to cheer her up and go forth with their own little quarreling. In the end, she finds salvation in Bacchus (a god she has literally indulged throughout the whole play). An entertaining and intelligently crafted opera production of one of the key operas exploring the intertextuality between of ‘real life’ and what today would be called ‘virtual reality’."